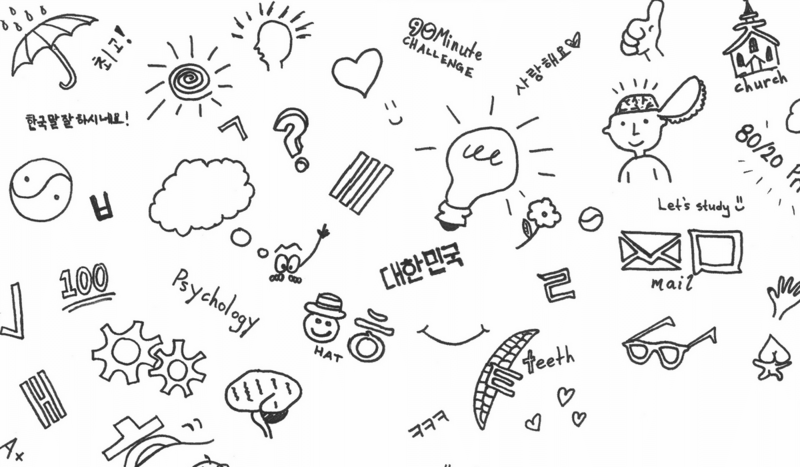 Visual associations to learn the Korean alphabet in record time! Would you like us to teach you a simple method for learning to read Hangeul (the Korean alphabet)? 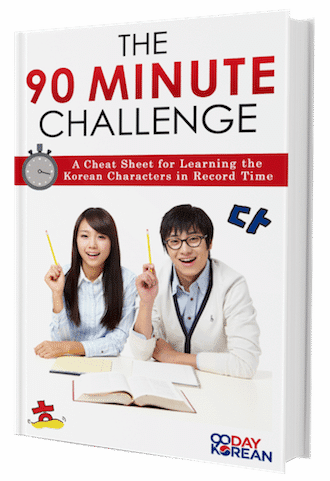 Our 90 Minute Challenge will give you visual associations and teach you everything you need to know to be reading Korean in the next 90 minutes (or less)! In 2018, it falls on February 16th; and in 2019, it falls on February 5th. Although Seollal itself is only one day long, the days either side of Seollal will also be public holidays. The exact number of days for the Seollal holiday depend on which day of the week it falls on. While the Lunar New Year is celebrated in countries across Asia, each country has their own way of celebrating the event. Korean Lunar New Year also has its own unique customs and traditions. While Christmas in Korea is usually a time for celebrating with friends or for going on dates; Seollal, like Chuseok, is more of a family based celebration. Many Koreans travel back to their family homes during this period. As a result, roads will be very busy during this time of year. Additionally, train, buts, and airplant tickets will either be sold out or very expensive. If you plan to come to Korea during Seollal, make sure you get a head start and book in advance! 세배 (sebae) is the most important of all the Korean Lunar New Year traditions. Sebae is the act of kneeling on the ground and bowing deeply so that your hands are also on the ground. Younger people most bow deeply to their elders and wish them a happy new year People often wear 한복 (hanbok), traditional Korean clothes, whilst performing sebae. To describe the act of sebae, the verb 드리다 (deurida) is used. For example 세배 드렸어요 (sebae deuryeosseoyo) would mean ‘I did the sebae bow’. When bowing, you can say 새해 복 많이 받으세요 (Sehae bok manhi badeuseyo), which means ‘Have lots of luck in the new year’. After receiving a bow from their youngers, the elders then say something along the lines of ‘I hope you stay healthy this year’ or ‘I hope you get married this year’ to their youngers. They will then give some money, known as 세뱃돈 (Sebae-don), to their youngers. This money is often given inside an envelope. Another important tradition is 차례 (charye). Charye is the term used for describing the worshiping of one’s ancestors during the Lunar New Year. Food is set out on a table as a gift for one’s ancestors, behind which are the family’s ancestral tablets. People perform deep bows to these tablets in order to show respect to their ancestors. This tradition is still performed by many Koreans but it isn’t quite as widespread as the other Seollal traditions. The most important food that is eaten during the Korean Lunar New Year is 떡국 (tteokguk). 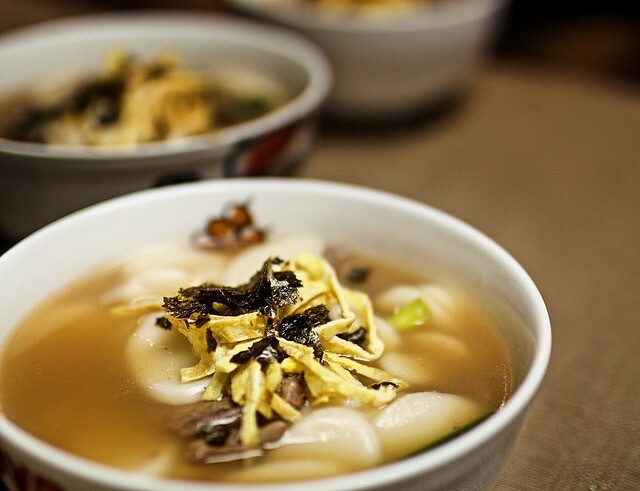 This soup is made using sliced ricecake, known as 떡 (tteok) in Korean. Tteokguk often also contains some meat and other things such as seaweed. Traditionally, the act of eating tteokguk at New Year turns you one year older in Korean. Don’t worry though; you only get one year older if you eat it over the New Year period, not at other times of the year! The white color of the tteok supposedly signifies purity. In the past, this meal was only eaten on Korean New Year. However, nowadays you can find in restaurants all year round. Another common food that is eaten during the Lunar New Year is 전 (jeon). Jeon is a pancake-like dish which often contains green (spring) onions or 파 (pa). The two most common types of jeon are 김치전 (kimchijeon) and 해물파전 (haemul pajeon), which contain kimchi and seafood respectively. Sometimes jeon is also called 부침개 (buchimgae). In addition to tteokguk and jeon, families often prepare many other foods and side dishes to eat at Lunar New Year. Just like how Western families often play board games at Christmas, Korean families often play traditional games together during Seollal. One of the most popular games is 윷놀이, pronounced yut-nori or yunnori. This game is played between two teams, and requires four special sticks. These sticks are curved on one side and flat on the other. Teams take it in turns to throw the four sticks in the air. The way that the sticks land determines how far the players move around the board. 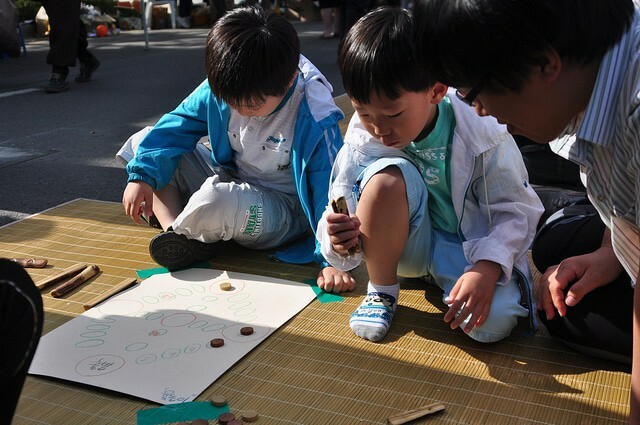 As well as yut-nori, other traditional games are often played over Lunar New Year. If you want to experience a traditional Korean Lunar New Year, then your best bet would be to get invited to a Korean family’s house. If you’re lucky enough to get an invite, you should take them up on the offer! While traveling during Seollal, keep in mind that it’s the busiest time of the year in Korea. A large percentage of the population is trying to get back to their hometown. Plan accordingly! Some people like to take advantage of the Lunar New Year holiday by visiting places that are usually crowded such as amusement parks. Seoul’s palaces are also a fantastic place for visiting during this time of year. That is because they often put on special shows and performances during the traditional holiday seasons. Since many places are closed during Seollal, it is best to quickly check online to see if the place that you are planning to visit is open before you travel. Better safe than sorry! 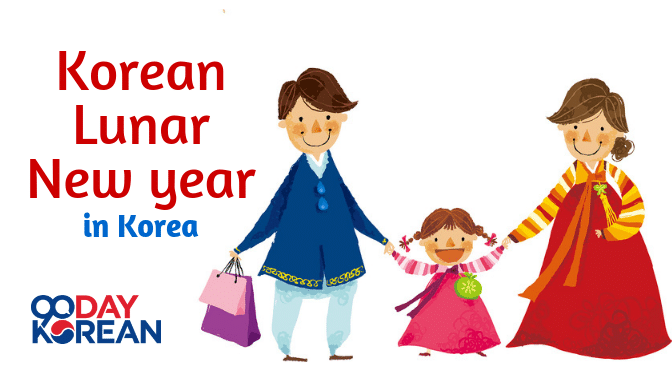 What do you plan to do over the Korean Lunar New Year? Let us know by commenting below!